Wrap each potato half in foil. Bake at 250°C (482°F) on the middle rack of the oven for 20 minutes. Then turn off the oven and leave the potatoes in the oven for another 20-25 minutes. Using a teaspoon, gently scoop out the potato flesh (save the flesh for another use, like mashed potatoes). Deep-fry the potato skins in preheated oil, turning once, until browned on both sides. Transfer the browned potato skins to a plate and set aside to cool. In a small bowl, stir the sour cream, garlic, pepper flakes and dried mint together. In another bowl, combine the chopped vegetables and herbs. Add the salt and lemon juice, and toss it all together. 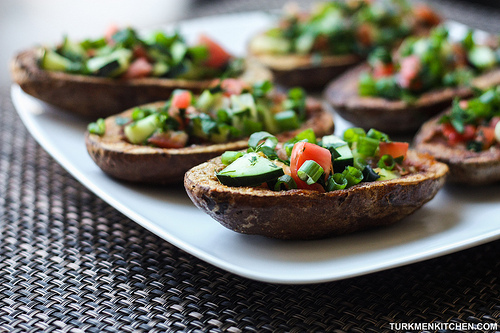 Add a dollop of the sour cream dressing to each potato skin, and then fill them up with the salad. Serve right away.